The Verax Polargate AL S can be characterized as a Pentium4 socket 478 heatsink, but compared to just about any other CPU heatsink on the market, it is radically different. 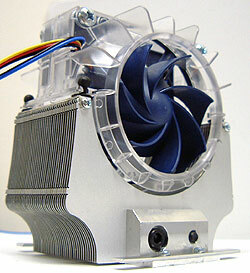 For starters, Verax have equipped the Polargate AL S with two of their ultra-quiet CAIRdB fans, back to back. The fans draw air in, and because there is a clear plastic divider between them, the exhaust is directed towards the bottom, or side of the fan where it enters the stacked aluminum fin heatsink. Verax's heatsinks have never been the kinds of coolers for overclocking as they focus on noise suppression first, and cooling second. Still, the Polargate Al S does take a few steps towards higher cooling performance which may interest some mainstream consumers."